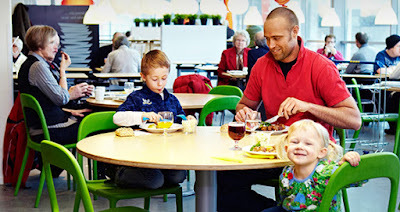 Savvy Spending: IKEA: Kids Eat Free through 1/1/16 with purchase of adult meal! IKEA: Kids Eat Free through 1/1/16 with purchase of adult meal! IKEA is offering FREE KIDS MEALS through 1/1/16! Get two free kids meals with every one adult meal purchased, with your IKEA Family Card. December 28th through January 1st, kids under 12 eat for FREE at IKEA restaurants! Get up to two kids meals (reg. $2.49 each) when you purchase one adult entrée and show your FAMILY card. Offer valid from December 28st to Jan 1st. Not valid on previous purchases and cannot be combined with other offers. Not valid online.